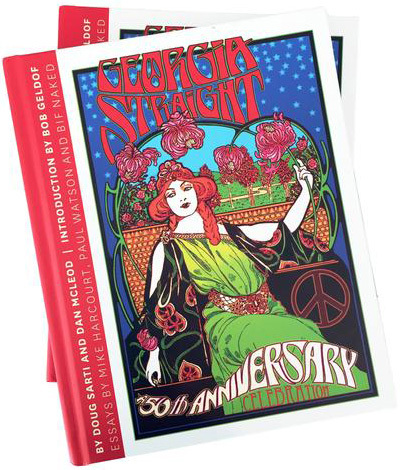 Conceived as an anti-establishment alternative to Vancouver’s conservative daily newspapers, the Georgia Straight was born on the eve of the Summer of Love. From its very first issue—dated May 5, 1967—the Straight showed itself to be a rebel with many causes, ruffling feathers and proving its mettle by tweaking the political powers-that-be. In the pages of the Straight, aldermen, mayors and premiers have always all been fair game. Raided by the police and fined for obscenity in its early days, the Straight soon found itself banned from distribution on city streets. Willing printers became difficult to find. The paper’s founder, poet and UBC math student Dan McLeod, was even briefly jailed. Despite the difficulties and harassment, the Straight became the first major Vancouver newspaper to give voice to the nascent environmental movement. In fact, contributors Bob Cummings, Irving Stowe and Paul Watson—who went on to found the Sea Shepherd Conservation Society—were among the founders and prominent campaigners for Greenpeace. In the mid-1970s, McLeod hired a young Irish writer named Bob Geldof, who served as the paper’s the music editor before going on to form the musical group The Boomtown Rats, and later achieving international fame as a humanitarian. Since those early days—which included staunch opposition to the Vietnam War, vocal support for the environment, a firm commitment to free speech and equal rights, not to mention some good old stickin’ it to the man—the Georgia Straight has both thrived and endured. As Vancouver’s pre-eminent arts, news, and entertainment source, the Straight is now even embraced by city hall, proudly winning a Mayor’s Arts Award in 2015. After half a century, the McLeod family still owns the paper, which has grown from a small underground periodical to a media powerhouse with more than 800,000 unduplicated readers per issue. There’s also a digital sister publication, the high-traffic website www.straight.com, which generates more than 2,000,000 page views per month. For a video history, check out The Last Streetfighter: The History of the Georgia Straight, created by former Straight contributor Tom Crighton and Tony Wade.